Veal isn’t so common in New Zealand and I had bought this leg of veal frozen, so decided to serve it along with other barbecued meats, salads and vegetables for a large summer gathering. I had lots of hungry guests so didn’t manage to take a photo of it garnished or served pulled with the remaining marinade drizzled over it. 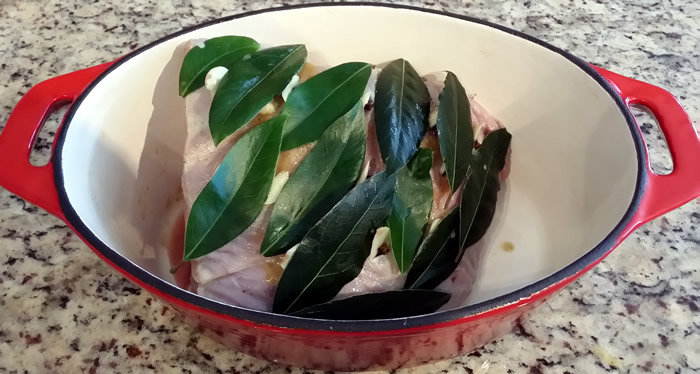 Try to use fresh bay leaves if possible and set some aside for garnish. 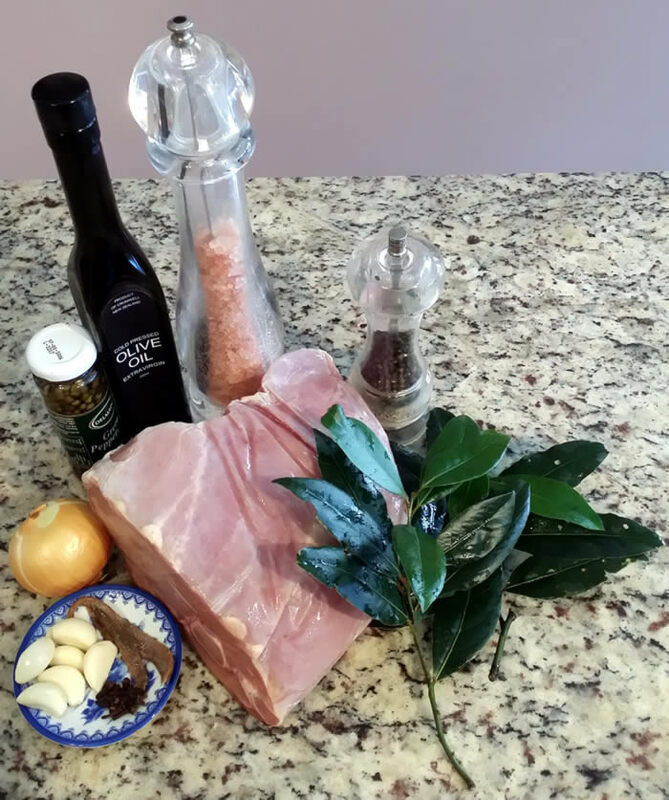 Combine the olive oil, anchovy fillets, crushed garlic, salt and pepper in a bullet and blend into a paste. Rub ⅓ over the veal and place in a heavy ovenproof casserole. 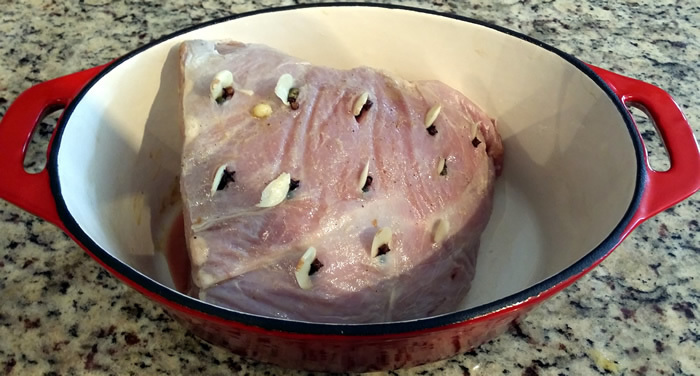 Using a sharp knife cut 12 pockets into the top of the veal and push a slice of garlic, a green peppercorn and a clove into each pocket. Put sliced onions under and on top of the veal and layer bay leaves on top. 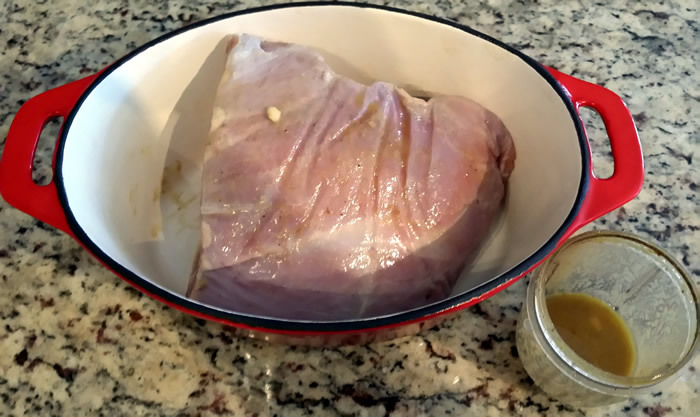 Drizzle on another ⅓ of the marinade and add a little water to the bottom of the casserole dish. Cover with heavy lid and cook at 160° C for 3 hours, adding a little more water if necessary a couple of times during that time. 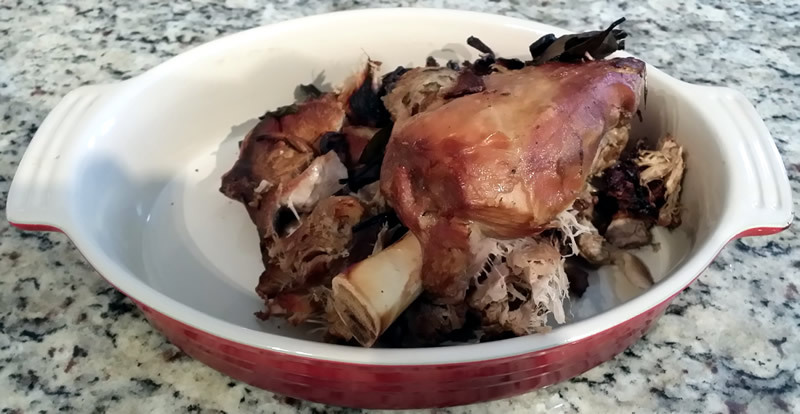 At the end of cooking the meat should be falling from the bone. Allow to cool a little and serve drizzled with remaining marinade – can be also served at room temperature or chilled if cooked the day prior to serving.